TUSCANY ACCOMMODATION. Hotel IL MOLINO DEL PONTE. Tuscany Hotel, in Montespertoli, Chianti - Tuscany. Family hotel, with garden and swimming pool, ideal for spending a holiday together with children. discount of 20% for students, 10% for adults. Valeria - Freiburg (Germany) . a rich and elegant buffet. Why IL MOLINO DEL PONTE ? The hotel "Il Molino del Ponte" is located in Montespertoli, "wine town" in the green of Chianti Tuscany. "Il Molino del Ponte" nominated by customers "Small Paradise", framed by the beautiful hills of Montespertoli, full of vineyards and olive groves, offers the opportunity to spend a wonderful holiday in the countryside of Chianti, in the heart of Tuscany. "Il Molino del Ponte" is an ideal base to sleep outside of Florence, away from noise and traffic, for those who love the Tuscan countryside, but not too far away from the culture of e Museums of Florence. "Il Molino del Ponte" is also near Empoli, San Casciano, Certaldo, Montelupo e Castelfiorentino. All rooms and apartments have digital TV (with USB port), Telephone, desks and chairs, heating, air conditioning and refrigerator. 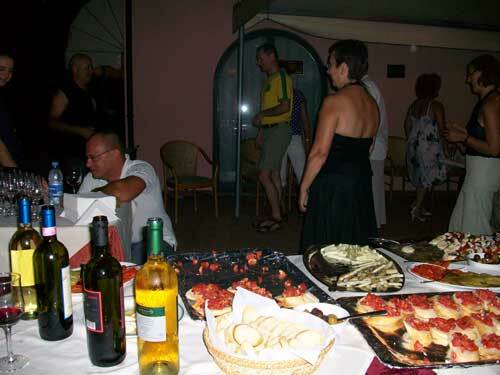 The all apartments have the kitchen area, with fully equipped and the living room and sofa. You have so many lodging possibilities: as a hotel (even for one night) and also as a residence (for a long period). 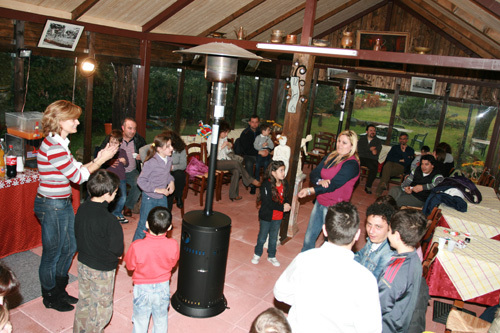 "Il Molino del Ponte", with its large garden and swimming pool is an ideal solution for families with children. "Il Molino del Ponte" for many years has hosted groups of students, motorcyclists and cyclists, groups of families and retirees. 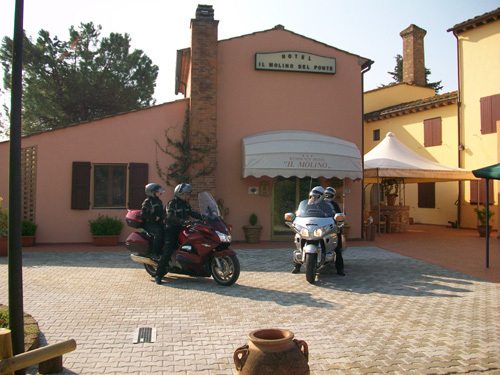 Are you looking for an accommodation, an ideal base for exploring Toscana with motorcycle? "Il Molino del Ponte" is located next to Via Volterrana (Wine Road of Montespertoli), one of the busiest roads by bikers, the road between Florence, Siena, San Gimignano and Volterra. The pool, which lies between the old walls, in an environment full of greenery, and iemmer under control, offers a real relaxing day. 200 m from us is also the municipal swimming pool with 25 meter bath. The morning begins with a rich and elegant buffet. - Online booking. 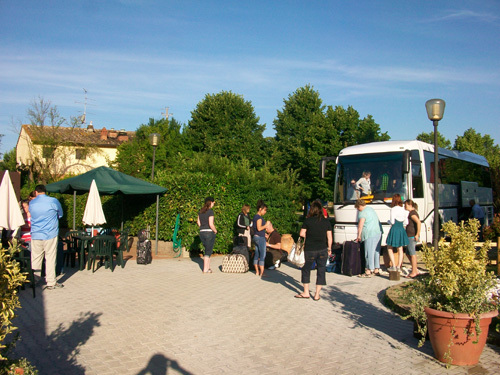 Special rates for accommodation in Montespertoli - the wine capital of Tuscany. Bar, Reception 24-hour, Garden, Family Rooms, Heating, Luggage Storage, Airconditioning, Fax / Photocopying. Free!Free WI-FI throughout the hotel (directly in the rooms and apartments). Free! Free public parking on site, without reservation. Free! All children under 6 years stay free. Free! All children under 2 years stay free of cots. The maximum number of cot in a room is 1. Extra beds and baby cots available on request and subject to confirmation by the hotel. Your privacy is protected. 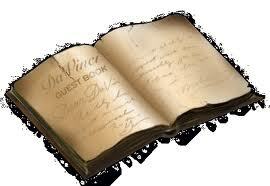 Your details are used, only to guarantee the reservation. No reservation costs. You pay in the hotel directly. The hotel will not charge on your credit card. Stayed two days. a good place to relax with a nice pool and shade under the trees in the garden. Left my Fitbit but the owners kindly sent on and didn't expect to be refunded the postage. Very kind of them. THE FESTIVALS - beautiful traditions.
" 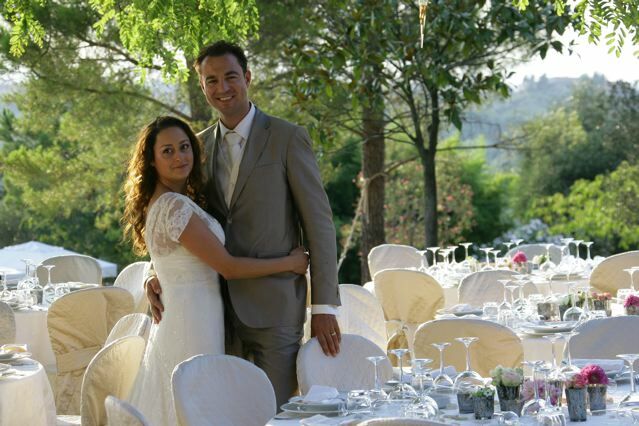 Will never forget our wedding in Tuscany. Il Molino del Ponte has prepared for our guests from Holland, a great feast..."
in the "Castello Sonnino" are the beautiful remembered. Not only in summer, but even under the snow Il Molino del Ponte is beautiful.